As you're aware, usually these Monday Morning Smiles are not kid-music-specific, but when I saw this video from Jim Gill, I knew that this movement-based song would be perfect for this morning of the first presidential debate of 2016. 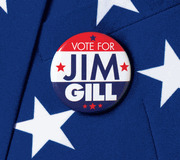 It's a bit of "Vote for Jim Gill," the title track from his brand-new album, and it's tailor-made for playing during the ad breaks in tonight's debate. It even includes a baby-kissing politician. Seriously -- couldn't be more appropriate for this evening's event. Posted in Monday Morning Smile, Videos and tagged with Jim Gill, politics, movement songs, videos. September 26, 2016 by Stefan Shepherd.